Are you frustrated by your inability to create or maintain the relationship you'd really like to have? What if it really were possible to have a relationship that was easy and fun? Dr. Kacie Crisp and David Caddy have had this for 27 years. 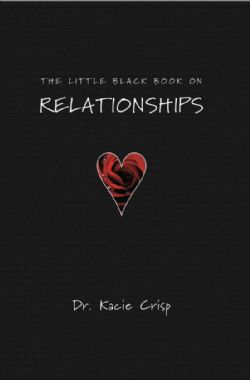 Kacie's book shares with you their 6 Do's and 6 Don'ts that can allow you to identify what you may have been doing or not doing to keep you from having the relationship you really desire. This is an easy read, full of stories and practical advice about how using the Access tools works in real life relationships. Many who order this come back and order more for their friends and family. What are the infinite possibilities? Dr. Kacie Crisp has been involved in facilitating others’ lives and bodies for her entire working life. As a therapist with emotionally disturbed children, chiropractor in the US and Findhorn spiritual community, and now as a licensed facilitator of Access Consciousness®, her great joy is to watch clients expand their lives. She is the author of The Little Black Book on Relationships about her 28 year relationship with her husband, David Caddy. She and David present have presented classes on relationships all over the world. Several of these classes are available under “specialty classes” on the website, www.accessconsciousness.tv. From her home in San Francisco, CA, she has facilitated classes all over Europe, the USA, and Australia. In addition to the Access Consciousness core classes (Bars though Level 1), she is one of 12 facilitators worldwide of the Access Consciousness Body Class. She also facilitates Right Voice for You classes—1 day long at this point and aiming for the 2.5 day version. Far from being a “singing class,” Right Voice is the possibility to change your whole life simply by being on stage in a safe, caring, supportive environment. She was the first to bring the Access Consciousness Core Classes and others to Scandinavia, Ireland, France, the Netherlands, Russia, Lebanon, and South Africa. Classes in several of these places have been the largest Access classes so far in those locations. Kacie’s latest adventure is moving to Belize with her husband David to build a house in a peaceful, spacious place on the Belize River.